Videotapes seized during U.S. raids on suspected al Qaeda in Iraq hide-outs show the terror group training young boys to kidnap and assassinate civilians, U.S. and Iraqi officials said Wednesday. Footage aired for reporters showed an apparent training operation with black-masked boys - some of whom appeared to be about 10 years old - storming a house and holding guns to the heads of mock residents. Another tape showed a young boy wearing a suicide vest and posing with automatic weapons. It's no game, reports CBS News correspondent Mark Strassmann. One recent killer in Iraq was just 11 years old. "He went into the home of a sheikh in the Anbar province with a box of candy that blew up, killing several," said Rear Adm. Gregory Smith, a U.S. military spokesman. U.S. and Iraqi officials said they could offer no estimate on how many children have fallen under the terror group's control. They named just a handful of attacks blamed on women or children. The American military said some of the tapes were found in December during a U.S. raid in Khan Bani Saad, northeast of Baghdad, and said it indicated a pattern that al Qaeda in Iraq was increasingly using children for sinister means. "Al Qaeda in Iraq wants to poison the next generation of Iraqis," Rear Adm. Smith told reporters Wednesday inside the heavily guarded Green Zone. 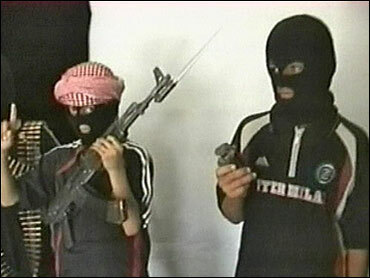 "It is offering children as the new generation of mujahedeen," he said, using the Arabic term for holy warriors. "We believe this video is used as propaganda to send out to recruit other boys ... and to send a broader message across Iraq to indoctrinate youth into al Qaeda," he said. Kids have often been used as props and pawns, reports Strassmann. In one jihadi video, a boy carries a mortar round. He's 6 years old - too small to reach the mortar without a boost. Other scenes from the Khan Bani Saad video showed masked boys forcing a man off his bicycle at gunpoint and stopping a car and kidnapping its driver along a dusty country road. At one point the boys - wearing soccer jerseys with ammunition slung across their chests - sit in a circle on the floor, chanting slogans in support of al Qaeda. "This is not only to recruit them, but also to demand ransom to fund the operations of al Qaeda," al-Askari said. Meanwhile, the U.S. military said Wednesday that its troops, along with Iraqi forces, detained 20 suspected insurgents in four days of raids across Iraq. The top uniformed military officer on Wednesday described a tired U.S. military force, worn thin by operations in Iraq and Afghanistan, and unlikely to come home in large numbers anytime soon. The assessment comes as President Bush decides whether to continue troop reductions in Iraq - possibly endangering fragile security gains made in recent months - or not, and risk straining ground forces further. "The well is deep, but it is not infinite," Adm. Michael Mullen, chairman of the Joint Chiefs of Staff, told the Senate Armed Services Committee. "We must get Army deployments down to 12 months as soon as possible. People are tired." Defense Secretary Robert Gates said Wednesday that the top military commander in Iraq is not the sole adviser on Iraq and suggested that President Bush this year will be confronted with competing views on what to do next in the war. Gates told the Senate Armed Services Committee that he will weigh in, along with the head of U.S. Central Command and the service chiefs. "It's clear that Gen. Petraeus' views will have a strong impact, but I think the president will need to hear other points of view as well," Gates said. Members of a pro-Kurdish political party set up camp near the Iraq border to protest Turkish military raids on Kurdish rebels based on the other side. Separately, a roadside bomb injured two police officers in a border area where guerrillas are active, local media reported Wednesday. The U.S. military said Wednesday that its troops, along with Iraqi forces, killed seven suspected insurgents and detained 34 others in five days of raids across Iraq. A roadside bomb exploded near a police convoy transporting suspected Shiite militia fighters south of Baghdad Wednesday, killing four passers-by and wounding nine other people, police said. At least 19 people were killed or found dead Wednesday across the country. The roadside bombing was an apparent attempt to free the 10 detainees who were linked to the Mahdi Army militia that is nominally loyal to radical Shiite cleric Muqtada al-Sadr, according to police Brig. Gen. Ghassan Mohammed Ali.